If we want to hire a marketer, how much are we expected to pay? Hopefully you've caught onto the fact that, this is the golden age of marketing. Marketing is playing an ever important part in the success of media and event businesses and at a time where technology, social media and innovation is key. 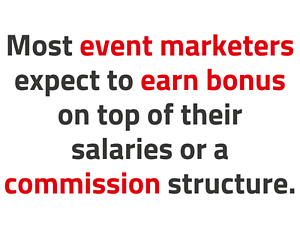 Therefore marketing salaries need to be at par or sometimes even higher than the average salary. At last the work of hardworking marketers is being accurately compensated. It's taken some time but we're getting there! 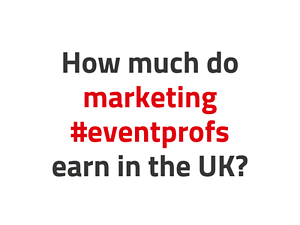 We work very closely withrecruitment agencies in the events industry and have asked our most trusted advisorsRupert Wallis from Media Contacts and Karen Gittins from Amdas to help us create an accurate guideline that both CEOs and Marketers alike can use when hiring marketing staff. Responsibilities: Generally email marketing campaigns, building presentation decks, executing basic marketing campaigns, social media, analyse import/export data, compile reports. They do all of the legwork and with close supervision. Responsibilities: Email marketing, social media, database work etc. While they do pretty much everything their junior counterparts do, these individuals are able to own their own campaigns, this means implementing and reporting on them. In the events world these guys are able to own an event from start to finish. They require less hand holding and are almost self-sufficient. Responsibilities: They would have project management as well as budget ownership. They will also work on strategic partnerships. Expect them to have the ability to create and lead marketing strategy, action it and very possibly mentor a colleague. You can give them a portfolio of products with no intervention or heavy supervision. Responsibilities: Creating, leading and implementing multichannel marketing strategy for a portfolio of products/division. Delivering campaigns with the assistance of 2 or more team members under their direction which will likely involve mentoring. Driving revenue, tracking and reporting ROI for their projects/division. Implementing or heavily involved with larger company-wide projects such as Marketing Automation, CRM, Website, Database strategy and of course GDPR initiatives. They know their trade and can implement marketing campaigns with their eyes closed. 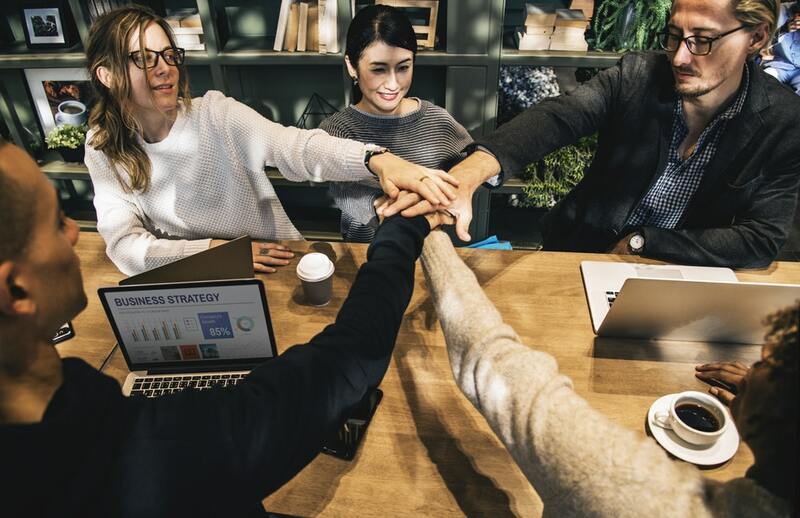 Whilst they can roll up their sleeves if necessary, they expect to oversee a small team of people both internally and externally (contractors/suppliers). Marketing Director - £60,000 - £90,000* per year. Bigger firms would normally pay the higher end or more. Responsibilities: Creating and leading overall marketing strategy for the business and managing overall marketing budget. Delivering marketing and sales targets through a team of marketing/web/social media professionals + third parties. Mentoring, training, recruiting and developing staff. Implementing Marketing Automation, CRM, Website, Database strategy and GDPR initiatives. Traditionally the marketing and sales functions had a very clear divide. But more and more we are seeing marketing directors becoming responsible for both teams and therefore the bottom line. In the larger firms these guys have the ear of the CEO and trust from their board. This is a strategic management role in organisations with a considerable marketing team size. These days we are seeing more companies paying out a fixed bonus instead of a commission based structure. 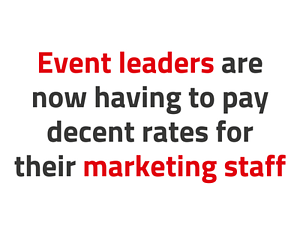 This is due to the fact that media and event companies havenow recognised that marketers have to put a lot of effort in before they see any particular results. Additionally companies are recognising that an underperforming event might not be the result ofpoor marketing strategy. It is important to note, this is purely a guideline and predominantly based on feedback from dozens of organisations and marketers we have worked with in the past 20 years. We would be very happy to run a quick staff assessment for you if you're in the midst of realigning your marketing team. Or certainly feel free to get in touch with Rupert or Karen who will be very happy to share their insights and help in any way. If you have any thoughts, comments or feedback of your own I'd love to hear from you. For more helpful tips on event management, join our webinar and reserve your seat by clicking below.